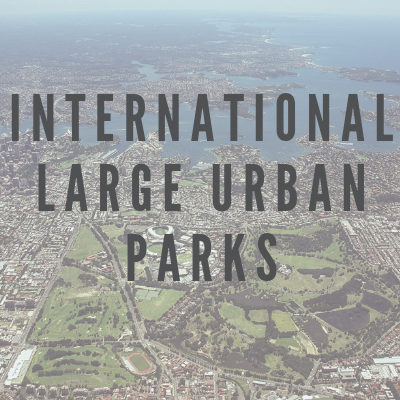 World Urban Parks is delighted to be conducting the second full year of the International Large Urban Parks Awards - recognizing the quality of the Parks, the skills of the people who manage them and the value they bring to the cities they serve. Richard Murray, Chair of the judging panel, announced the awards and commended the quality of applications, "These inaugural awards reflect the global importance of Urban Parks - spaces that help with health, the environment and community cohesion. I congratulate each of the winners for all they do to make their cities more livable. Step #1: Please Sign-Up before you register for the 2019 International Large Urban Parks Award. It is free to do so, as you do not need to be a member of World Urban Parks to sign up and participate in the 2019 awards! We look forward to a diverse set of 2019 applicants! Step #2: Read through the criteria for the award application - Click to Download. *Please note. All documents must be submitted in English and the application fee must be received by May 17th to be in good standing order with your application. We will be following up with you to process the application fee ($550 NZD for World Urban Park Members, $800 NZD for non-members). Step #4: Complete the checklist form below once you have completed and submitted your full survey form in Step #3. Step #5: World Urban Parks will be in touch with you to confirm your application and to process the application fee and provide any additional information you may require. *ALL APPLICATION MATERIAL MUST BE IN ENGLISH. Your application will not be processed unless provided in English. Ahmad Nazrin Aris Anuar is from Malaysia. He works as Senior Lecturer/Head at Centre of Studies for Park and Amenity Management, Faculty of Architecture Planning and Surveying at the University of Technology MARA. He has a Phd in Development Science (Tourism Management) from National University of Malaysia. Previously he has worked for Environment Executives at Putrajaya Holdings which handle many projects for Putrajaya development such as Government Building, School, Landscaping, Park and amenities. He has been a member of WUP since 2017. Tim has a Bachelor Degree in Urban Horticulture and is a Certified International Parks Professional. He has 40 years´ experience in local government in Australia, in strategic, financial and operational management of the Parks, Urban Landscapes and Recreational services. Experiences include bushland management, redevelopment and preservation of heritage listed sites, development of major sporting complexes and revitalisation of CBDs and Urban Spaces. His present position is Service Manager - Urban Landscapes at Queanbeyan Palerang Regional Council in Canberra, Australia. Tim also serves as Co-Chair of the Advocacy Committee – Older Adults in Parks, for WUP. Richard is a PhD in Macro Economics and has worked for 27 years with the Swedish Agency for Public Management with public administration issues. He started a green party in Stockholm in 1979 and served on the City council and various boards for 11 years. Since 1993 he heads Ekoparken Association, an umbrella for 50 NGOs that guard and support the Royal National City park in Stockholm. The park was created by parliamentary law in 1995 after successful lobbying. Together with WWF Sweden he in 2015 arranged a conference in Stockholm - Large Parks in Large Cities with representatives from 26 countries. 2016 Ekoparken Association joined WUP. Richard serves as Co-chair of Large Urban Parks Committe for WUP. Eric Tamulonis is a landscape architect whose career has focused on planning and designing public parks and open spaces. Grounded in the conviction that parks are among the great cultural achievements of society, his work includes national, state, city and community parks and open space systems in diverse urban and natural environments in the United States. Tamulonis' projects have been recognized with national and regional awards from the American Society of Landscape Architects, American Planning Association, and National Park Service. A board member of the City Parks Alliance, he is devoted to advancing the current state of practice in public parks through international, national and local organizations. He has lectured internationally and written on the subjects of parks and environmentally-focused campus design. Mary is Senior Manager Parks, Coast & Countryside at Wirral Metropolitan Borough Council in England. She is Responsible for management of Wirral’s parks system including Birkenhead Park and 240 other parks and gardens. Mary has been a Green Flag and Green Heritage judge since 2004 and before moving to the Wirral chaired London’s Parks and Greenspaces Forum. Mary has spent time living in Addis Ababa, Ethiopia whilst completing her Doctorate in public parks skills development.